Our Geared 2U Design Team along with all the many imaginative Ideal Steel Hybrid owners are creating stoves that are far more than just steel boxes of heat. We are “fired-up” with excitement at Woodstock Soapstone these days because things are really starting to roll with our new custom stove designs. Less than a year into production, the creation of the Ideal Steel Hybrid has allowed us to create one-of-a-kind woodstoves on entirely unique platform in the industry. These Hybrids are not only beautiful, but also have deep personal meaning to their owners. Stories behind these Ideal Steels have been touching, fun, mysterious...and also quite personal so it’s impossible not to feel great enthusiasm about this new “art form” we have created with woodstoves. It’s exciting! Take a look below at just a handful of recent designs. 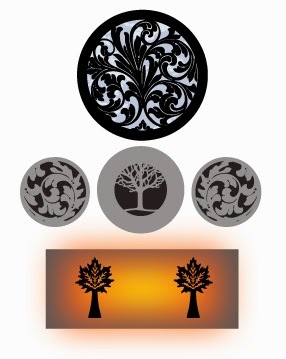 Beyond the circular side designs we also offer burner/cooktop and andiron designs (shown in the bottom grouping). Our owners are part of a 37 year-old growing “family” and we do know that a woodstove is a purchase of a lifetime for many of you. Making that experience more meaningful is something we are inspired about. 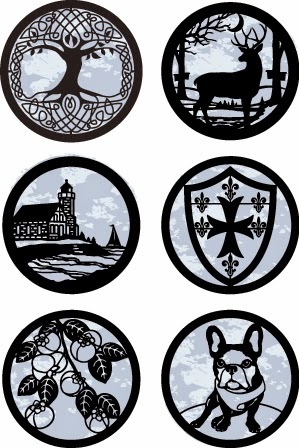 Above are six recent designs for side medallions. Below is a recent complete design set, with side art, top burners, and andirons (from top to bottom). More tomorrow!